The commentary coincides with the recent energy ministers meeting in Kananaskis, AB and has appeared in publications across the country such as in the Truro Daily News, Saint John Telegraph-Journal, Surrey Beacon, and Calgary Beacon. OTTAWA – Federal taxpayers are on the hook for an explosion of liability payments to fund provincial electricity misadventures, the worst of which are undermining Canada’s international trading reputation. And a federal-provincial energy conference, in Kananaskis, Alberta, which runs until July 19, threatens to up the ante. For example, last week Texas energy titan T. Boone Pickens launched a $775-million NAFTA challenge alleging the Ontario government has discriminated against his privately-owned wind energy company. It is the federal government, however, that Pickens is looking to pay up. The federal government is also defending protectionist elements of Ontario’s controversial Green Energy Act against a challenge Japan has launched with the support of the United States and European Union at the World Trade Organization. But Ontario is not the only province with electricity initiatives undermining Canada’s trading reputation, with the bills going to Ottawa. Last August federal taxpayers were obliged to pay $130-million to settle a claim for damages under NAFTA by the industrial firm AbitibiBowater after the government of Newfoundland and Labrador confiscated its electricity generation assets. Far from holding the Newfoundland government responsible for shafting federal taxpayers, however, Prime Minister Stephen Harper then agreed to provide loan guarantees for a Labrador power megaproject to build submersible transmission lines, even though the economics are dubious. By offering the subsidy, Harper effectively both rewarded Newfoundland’s government for confiscating AbitibiBowater’s assets and impaired Canada’s trade reputation in an unsuccessful bid to win seats on the Rock during the last election (although the Conservatives did pick up a seat in Labrador). Newfoundland justifies its power megaproject on the basis that provincial power costs are going to soar anyway, eventually making pricey Labrador power relatively cheap by comparison. Most of the new Labrador power, however, is earmarked for the Maritimes and potentially New England, which, unlike Newfoundland, already have access to North America’s glut of natural gas, a key factor driving down average power rates across the U.S. The subsidy is also likely to attract yet more trade complaints from electricity generators in New England, particularly those now selling significant amounts of power to the Maritimes. International competitors of export industries in Atlantic Canada may also complain. The Newfoundland government estimates that the federal loan guarantee will cut local power costs by six or seven per cent. Unfortunately, cost over-runs, which are likely, could push the value of the federal guarantee much higher. The Kananaskis meeting provides a platform for provincial governments and lobby groups to push the federal government deeper into provincial electricity matters. Many of them, including the governments of Ontario and Newfoundland and Labrador, have demanded that the federal government subsidize interprovincial transmission projects. Ontario is also demanding federal subsidies for its nuclear expansion ambitions. Even if the federal record in the electricity business was solid, and it isn’t, any federal spending in provincial energy affairs will not only annoy our trading partners but also promote inefficiency and create jurisdictional confusion. It would be better if the federal government focused its involvement in the electricity sector on its core constitutional responsibility of promoting interprovincial trade and commerce. The best way to make Labrador power truly competitive against abundant natural gas is to achieve the best possible economies of scale with more affordable transmission over land rather than under water. To reach markets in Ontario or the U.S. Northeast, Labrador power has to pass through Quebec, which has its own electricity export ambitions. If those provinces cannot negotiate a mutually agreeable solution, the federal government should act to ensure the constitutionally-guaranteed freedom of interprovincial trade. Ontario and Newfoundland should not require Quebec’s approval to move electricity, any more than Alberta needs Saskatchewan’s permission to move natural gas to Manitoba, Ontario and Quebec. While Quebec will not welcome another big hydro-power competitor, particularly while market prices are low, to maintain its access to electricity markets in the United States it already accepts the U.S. Federal Energy Regulatory Commission’s non-negotiable rules compelling them to open their market to electricity imports. 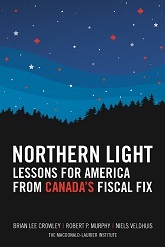 The constitutional powers that the U.S. relies upon to promote highly successful inter-state trading are similar to our own federal government’s constitutional authority, which Ottawa has always been reluctant to exercise in the electricity sector. Canadians should be entitled to an open national electricity system where no province can hold its neighbours hostage and where power can be bought and sold freely. * Tom Adams is a Toronto-based electricity consultant. Brian Lee Crowley is the Managing Director of the Macdonald-Laurier Institute, an independent non-partisan public policy think tank in Ottawa (www.macdonaldlaurier.ca). This column is distributed by the Troy Media Corporation.